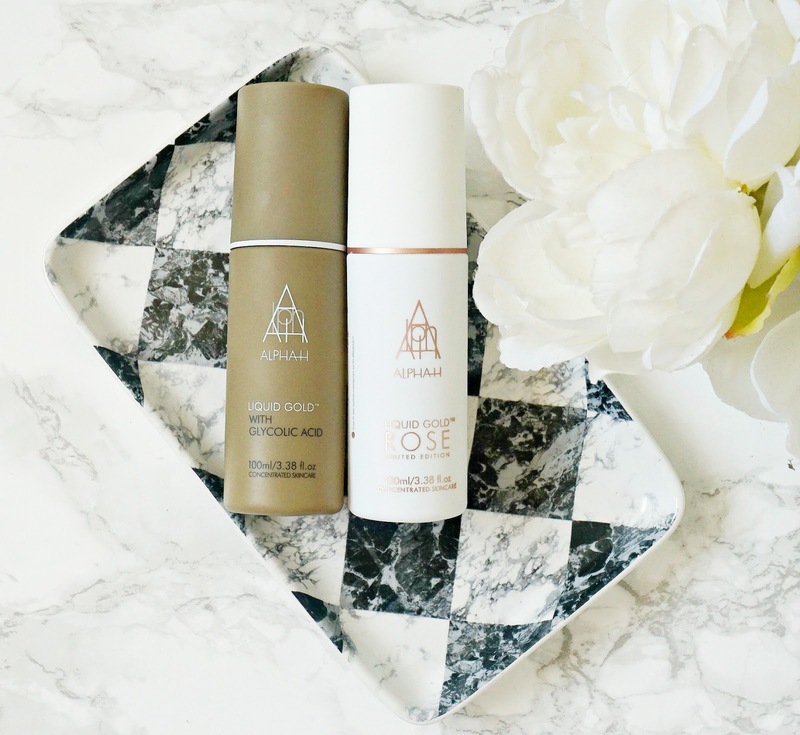 I've been a big fan of Alpha-H Liquid Gold for around 4 years - it's one of those products that has become a staple in my routine due to its effectiveness so I must admit that I was very intrigued by their new limited edition release - Alpha-H Liquid Gold Rose and when I mentioned that I bought it, a lot of you were too and were eager to hear my thoughts but I needed to give it a good testing before sharing my thoughts - two months later, I'm ready to do so! So what is Liquid Gold? For those of you who don't know and have never used Liquid Gold before, it is a glycolic acid overnight treatment (5% glycolic). Glycolic Acid is a chemical exfoliator (not as scary as it sounds! ), which removes dead skin cells, revealing brighter, fresher skin and it also encourages collagen production. For me, Liquid Gold is a product that gives visible results the day after using it - skin looks clearer, feels softer and pores appear more refined. Over time, I have found that old scars have healed, hyper-pigmentation has faded, little bumps under the skin have disappeared, blemishes have become few and far between and my pores are refined, which is why it has been a steady repurchase over the past few years. It is applied at night by swiping a soaked cotton pad all over the face and neck. The first few times I used it, I experience some tingling (but it wasn't uncomfortable) as my skin was not used to acids at that point, but I don't experience that now. The directions are to use 2/3 times weekly and not to apply any products over it for an intense treatment, which I used to do but I now follow with a moisturiser because I found that my skin felt very dry the morning after using it if I didn't follow with an oil or cream. If you have found the same, I would recommend doing this too and it is imperative to wear SPF the next day as acids make the skin more sensitive to the sun - although we all know that this is something that should be done daily regardless. The full ingredient list of Liquid Gold: Aqua, Alcohol Denat, Glycolic Acid (5%), Glycerin, Hydrolyzed Silk, Potassium Hydroxide, Phenoxyethanol, Caprylyl Glycol, Glycyrrhiza Glabra Extract. So what is so different about Liquid Gold Rose? Apart from the very aesthetically pleasing packaging, this product has all of the benefits of the original Liquid Gold, combined with moisturising properties of rose, lotus and orchid petal extracts and the anti-inflammatory benefits of Scandinavian Red Algae, making it even more suitable for sensitive, mature and dry skin types. As I have dry skin, I am delighted to have Liquid Rose in my life because I get all of the benefits of Liquid Gold but my skin also feels more hydrated. I have used it both with and without a moisturiser afterwards and unless your skin is extremely parched, it is not necessary to follow up with a cream or oil. At the moment, this is limited edition but I am hoping it becomes part of the permanent line up. The full ingredient list of Liquid Gold Rose is: Aqua, Alcohol Denat., Glycolic Acid, Glycerin, Hydrolyzed Silk, Butylene Glycol, Maris Sal, Sodium Carrageenan, Potassium Hydroxide, Nelumbo Nucifera Flower Extract, Orchis Morio Flower Extract, Polysorbate 20, Rosa Damascena Flower Water, Phenoxyethanol, Pelargonium Graveolens Oil, Caprylyl Glycol, Glycyrrhiza Glabra Root Extract, Citronellol, Geraniol, Limonene, Citral, Linalool. So which is for you? If you have dry or mature skin, I would definitely recommend Liquid Gold Rose but if you have oily or combination skin, then the original Liquid Gold is the one for you. Have you tried either of these? I would love to hear your thoughts in the comments below!